Ever since the introduction of the LiveScribe Smart Pen which allows you to capture pen strokes on special LiveScribe paper and later transfer it to your computer, Iv’e been expecting Wacom to introduce a similar product. Finally it’s here. 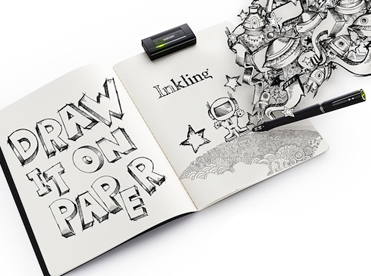 The Inkling Digital Sketch Pen captures your sketches with its ballpoint tip on any sketchbook or standard piece of paper. The main difference between this system vs. others especially for an artist is Wacom’s pressure technology which records a whopping 1,024 levels of pressure. This will enable Inkling to capture anything from a feather light touch to the most aggressive paper scraping stroke. The part that I’m really excited about is importing my sketches from Inkling Sketch Manager into Adobe Illustrator as a vector instead of having to bust out the ole scanner, convert the sketch to blueline and pen tooling it just to generate a nice scalable vector. This is going to be a huge time saver and may actually lead to me sketching more. It sells for about $200 and was supposed to be available in mid September 2011 then it was pushed to mid October and now it’s release is said to be mid November. Dang Wacom, you’re killing me! Also, what is your obsession with the middle of the month? Update: Based upon this review in PCWorld I think I’ll wait until version 2.0 is out.